The cabinets are found above and below the countertops across modern kitchens in Pakistan. They are usually separate structures and offer sufficient space to store all kinds of kitchen utensils, equipment and the uncooked food items. 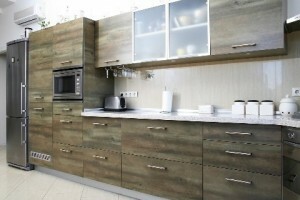 If we have a look at the older construction in Pakistan, we’ll find out that cabinets were made with simple designs without much style and elegance however the modern luxury homes in Lahore and in other urban cities like Karachi and Islamabad have contemporary kitchen cabinets installed in accordance with the requirements of the dwellers. As the name suggests, the oven cabinets also known as the oven cupboards are constructed below and/or next to the oven or cooking range. These cabinets provide sufficient storage capacity for the frequently used cooking tools. Placing them next to the oven or cooking range makes cooking faster and easier. 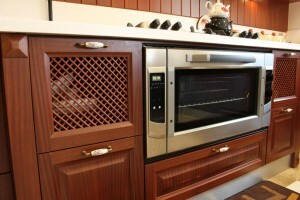 When it comes to microwave ovens in smaller kitchens, the cabinets are often located above the oven. 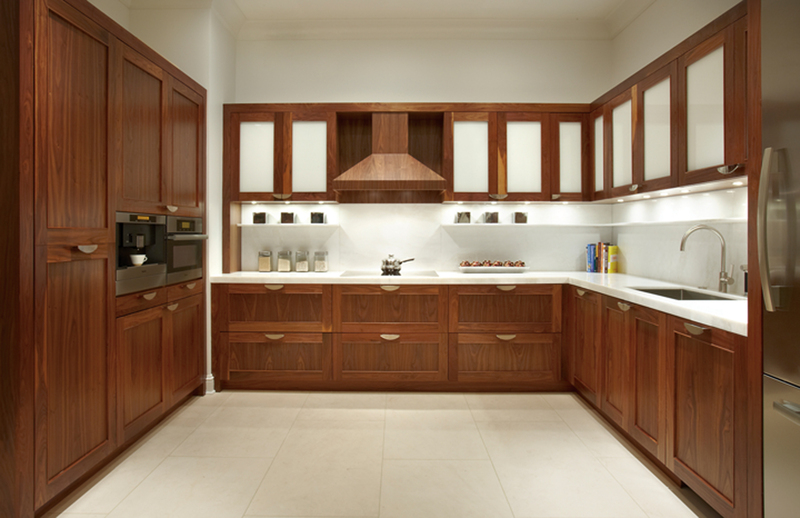 The island cabinets, as the name suggests are isolated from fixed wall cabinets which is why they are known as the island cupboards or cabinets. These separate structures are made out of wood usually with marble shelves. The island cupboards/cabinets are usually installed in larger kitchens that are often used by families as breakfast bars or as place for entertainment and get together parties. They not only serve as the dining area but also provide sufficient space for storing food products and all other types of cookware. The island cupboards are the prominent element of modern house designs in Lahore and are preferred by all modern families. These kinds of cabinets are the latest kitchen cabinet/cupboard trend in Pakistan. If we have a look at the modern construction in Pakistan we’ll find out that kitchens mostly come with horizontal cupboards/cabinets instead of the conventional vertical door-like cupboards. The reason behind the increasing popularity of these cabinets is the fact that they are way too easier to use than the vertical door cabinets. They come attached with gas strut support hinges that hold them firm open until closed. 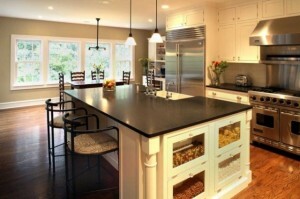 Another quite popular kitchen cabinets trend is the color themed cabinets. Some people find maroon and red as the most appealing colors for kitchen theme while others find blue, purple or sea green as the best colors. 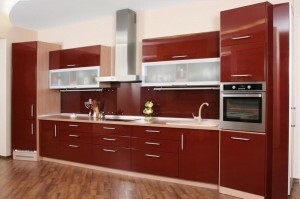 The modern home construction firms make use of color themed these days to make a statement with the kitchens.